InPixio Photo Editor from Avanquest Software is a comprehensive graphic editor software that features enhance photos with one click. InPixio Photo Editor can quickly and easily convert photos into amazing works of art. Editing photos now become simple with InPixio Photo Editor. 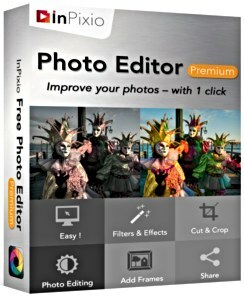 Similar Photoshop, the software brings lots of advanced editing features such as filters and effects (Lomo, Black and White, Vintage, Photography, Portrait, etc. ), crop or resize, tint, saturate, adjust brightness and contrast, frames, and textures. 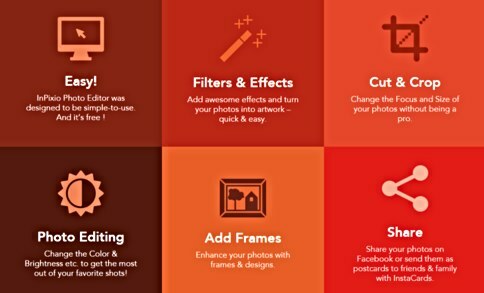 InPixio Photo Editor comes with 2 version – Free and Premium. The premium version add dozen of awesome featurea compare to free version. In addition, InPixio Photo Editor Premium also allows produce professional photos and share on social media or send as postcards to family and friends. Add filters & photo effects: warm, black & white, pink lady, negative, sepia, science fiction, vintage. Edit photos: change the colour & brightness etc. Use classic frames, design frames, coloured or fun frames to create unique pieces of art!]. Filters & effects like vintage, black & white, seasons, old film, cinematic, and much more. Blur tool Includes Tilt-Shift & Artistic Blur effects that bring the subject of the photo to life. Textures can be used to add amazing overlays. Tone Curve – used to brighten or darken tones in your image. Vignetting – Create professional looking photos with oval frames. Batch Mode – apply changes to a several photos at once. Save personal presets that can be used in a single click for future projects. More than 80 original frames: Use classic frames, design frames, coloured or fun frames to create unique pieces of art. More than 100 filters & effects: themes likes vintage, black & white, seasons, old film, cinematic, and much more. Blur – Includes Tilt-Shift & Artistic Blur effects that bring the subject of the photo to life. InPixio Photo Editor Premium normally cost $39.99 for purchase. As part of promo offer, Avanquest Software is collaborate with SOFTONIC to giving away free full license of InPixio Photo Editor Premium to new subscribers. Click on “DOWNLOAD NOW” button. InPixio Photo Editor Premium supports Windows XP, Windows Vista, 7, 8, 8.1, and Windows 10.